Gathering source material from newspapers, social media profiles, broadcast television, and YouTube searches, Casey Reas has created series of software-based collages that manifest his personal confrontations with media. Reas, an artist and educator based in Los Angeles, will speak about his work with mass media from 2012 to the present. There’s No Distance, a solo exhibition of Reas’ work, will open at bitforms gallery on September 10. Reas is a co-founder of the Processing Foundation, whose mission is to promote software literacy within the visual arts and visual literacy within technology-related fields – and to make these fields accessible to diverse communities. Future programs in this series will be hosted in collaboration with the Processing Foundation. Founded on the premise that the sustained interaction of writers and photographers can produce an expanded horizon for printed and time-based works, Image Text Ithaca at Ithaca College offers an MFA program, a summer workshop and symposium and the publications of the Image Text Ithaca Press. Please join us for an evening of informal readings by recent fellows from the Image Text Ithaca workshop and symposium—Lucas Blalock and Andre Bradley—followed by signings of two recent publications of the ITI Press: Andre Bradley's Dark Archives and John Keene and Nicholas Muellner's Grind. In this three-hour, role-play-based workshop, participants will learn to safely and securely communicate via encrypted email, using the initial communications between whistleblower Edward Snowden and journalist Laura Poitras as their guide. To address the uncertainty of knowing if their communications are secure, participants are invited to assume the roles of both whistleblower and journalist, as they reenact the first emails between the two and learn the steps required for smuggling national secrets. Participants will learn how to make initial contact and verify trust with a previously unknown individual, how to utilize public social-networking platforms such as Twitter as a safeguard against potential tampering, and how to gain a technical understanding of encryption protocol and email-encryption software. No experience necessary. Becoming Anonymous is a workshop aimed at sorting through the murky world of online privacy. With a focus on secure Internet browsing, participants will learn to use a set of online tools designed to limit and block surveillance of their online browsing. More importantly, they will delve into the processes through which information is gathered on them as Internet users, and learn how simple shifts in online behavior can dramatically affect the online data they make available about themselves. No experience necessary. Surveillance Index Edition One is a reference tool and compendium documenting one hundred books related to surveillance photography. The volume marks a time in history when surveillance and the imagery resulting from it have become inescapable parts of our lives, as well as subjects often confronted by artists. Carlo McCormick’s essay in the book, titled “The Eyes Have It,” offers historical context and parses the art historical precedents for this theater of observation. Designed as a reference manual, Surveillance Index Edition One indexes each work by year of publication, title, photographer, description, size, and code. It also includes a representative spread from every title, unique descriptions of every book, a poster showing all the books from Edition One, and a special-edition bookmark. Neutral is the first sort-of-catalogue which consists out of the group of works entitled: Carry On (out of the project #Evidence, 2015) together with works from Kruithof's latest series, Neutrals (2015) and Concealed Matter(s) (2016), the first consisting of metal structures combined with images printed on PVC, vinyl and latex, and the second made up of images printed on latex, draping over security camera bracket arms. To reserve a signed copy of Neutral, please email info@spacescorners.com. Lex Brown, artist and author of the recent book My Wet Hot Drone Summer, presents Hard Numbers, a scripted and improvised performance live at the ICP Museum. Through interviews, video recording, data collection, and eyewitness accounts, the Hard Data news team reports on what matters, as it happens. No story too big, no controversy too small. In 2014, New York–based photographer Darin Mickey (born 1974) began documenting a handful of record shops in New York, New Jersey and Pennsylvania—independently run stores that opened primarily in the 1960s, 1970s and 1980s, many of which are now on their last legs, or have recently been shuttered. These stores are the alphabetized havens for the musical successes of a few and the forgotten failures of many. Shot from the perspective of a middle-aged man restlessly clinging to his youth and the hope of finding that elusive artifact to make anxiety subside and keep the reaper at bay, Death Takes a Holiday shows us a community of beautiful recluses brought together by obsession, compulsion and a pure, undying love of music. Visit Spaces Corners to preorder a signed copy of Death Takes a Holiday. Social media has changed the way we think about visibility, intimacy, and self-representation, and has reshaped our personal boundaries. Susie Lee, visual artist, CEO, and entrepreneur-in-residence at NEW INC, guides us through the ubiquitous “shopping-for-humans” online model and presents an alternative—a way of closely connecting people through technology—with her award-winning dating app, Siren. Spaces Corners at ICP Museum invites you to a book signing for A Spectacle and Nothing Strange by Ahndraya Parlato and ZZYZX by Gregory Halpern. Christian Hawkey will present a short reading from A Spectacle and Nothing Strange beginning promptly at 7pm. Combining ten years’ worth of images, A Spectacle and Nothing Strange draws on Parlato’s experience being raised by a single mother who was mentally ill. These photographs allow her to move between various realities, acknowledging the validity of her mother’s world, while also questioning the boundaries of normal, abnormal, sane, and insane. The pictures in ZZYZX begin in the desert east of Los Angeles and move west through the city, ending at the Pacific Ocean. This general westward movement alludes to a thirst for water, as well as the original expansion of America, which was born in the east and which hungrily drove itself west until reaching the Pacific, thereby fulfilling its “manifest” destiny. Visit Spaces Corners to preorder a signed copy of A Spectical and Nothing Strange and ZZYZX. The International Center of Photography and Anthology Film Archives are delighted to present an evening with legendary American paparazzo Ron Galella. The evening will include a screening of “Smash His Camera” (2010), the award-winning HBO film directed by acclaimed documentarian Leon Gast (“When We Were Kings”). The screening will be followed by a Q&A and book signing with Ron Galella. For information on purchasing tickets, please contact Anthology Film Archives. ICP and Anthology Film Archives continue their ongoing collaboration with a second film series inspired by the new ICP Museum’s inaugural exhibition, Public, Private, Secret (on view through January 8, 2017). Combining narrative films like “Body Double” and “A Short Film About Love” with experimental films, documentaries, and video art, the series demonstrates how the ideas of voyeurism, surveillance, and identity have been central throughout the history of cinema. ICP Members receive a special rate of $7 per ticket. Please present your membership card at the AFA box office when purchasing. Investigative Practices 101 is a three-hour investigative-journalism workshop intended to empower participants with the tools to begin pursuing journalistic investigations of their own. Anne Elizabeth Moore will lead participants through the basic steps of any amateur investigation, from formulating initial questions and identifying involved parties, to basic interviewing techniques and journalistic etiquette. Finally, participants will learn to use a set of online tools and databases geared towards locating documents relevant to their investigation. No previous experience required. Radical Networks is an annual conference organized by Sarah Grant, Amelia Marzec, Erica Kermani, and Eyebeam. It brings together practitioners who analyze and use accessible networking technologies to understand methods of control. This reading group meeting, and ICP Museum poster wall display, will be centered on an open conversation about access and privacy. All welcome! Join Radical Networks at Elsewhere, Brooklyn November 4–6, 2016 for three days of speakers, panels, workshops and an art exhibit designed to introduce the community to DIY networking. More information at: http://radicalnetworks.org/. Spaces Corners at ICP Museum invites you to a book signing for Anthony Hernandez, published by D.A.P. 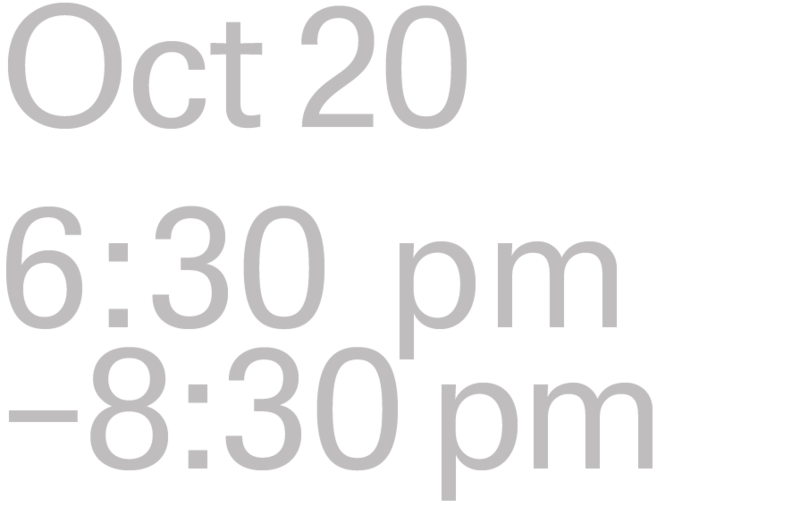 and SFMOMA, on Thursday, October 20 from 6:30 to 8:30 pm. Since the early 1970s, when he began photographing on the streets of his native Los Angeles, Anthony Hernandez has consistently pushed his practice into uncharted territory, challenging himself by adopting new formats and subject matter. Email info@spacescorners.com to reserve a signed copy of Anthony Hernandez. How do you make something disappear? Half philosophical exercise, and half skill-based experience, participants in this drop-in event will explore ideas of disappearance, including how to make digital and physical objects disappear, and even attempt to vanish themselves. Selfies are often dismissed as vain attempts at self-promotion, yet nearly every candidate in the 2016 presidential election has stopped to take them with their supporters. This discussion—featuring interdisciplinary researcher David A. Banks and journalist and author Melissa Gira Grant—centers on how the selfie took on a new identity through dissemination over social networks and moved into the political mainstream. Spaces Corners at ICP Museum invites you to a book signing for The Epic Love Story of a Warrior by Peter Puklus on Thursday, November 3 from 6:30 to 8:30 pm. Visit Spaces Corners to preorder a signed copy of The Epic Love Story of a Warrior. The three-hour Our Net workshop will enable participants to develop their own private networks that exist independently of the Internet. Attendees will build and experience a networked environment and compare it with the World Wide Web and commercial social networks. They will leave the workshops with enhanced digital literacy and an understanding of privacy on the Internet, including its origins and history. Families with youth 14 and over are encouraged to attend. Claire Kearney-Volpe and Chancey Fleet will demonstrate the process of learning to code used by blind and partially sighted people. Their research process will be discussed, and participants are asked to bring their laptops [mac preferred]. Those willing will be blindfolded and guided through the process of coding without sight. Laptop required, no coding experience necessary. Lockdown Archive, included in Public, Private, Secret, is a collection of 370 photographs found on the web and reorganized chronologically, by category and by location, in order to provide an encyclopedic overview of the Watertown manhunt in 2013. Visit Spaces Corners to preorder a signed copy. Spaces Corners at ICP Museum invites you to a book signing for Let It Bleed by Rona Yefman on Thursday, November 17 from 6:30 to 8:30 PM. As early as 1996, her younger sibling, Gil, was Yefman’s first model and inspiration. She began an intimate image record of their adolescence, using the camera to invent multiple novel identities in an imaginative world they constructed for themselves. This body of work became a joint archaeological journey, chronicling two siblings’ symbiotic existence as collaborative artists, and their mutual desire to live exterior to the norm. The most complex part of this project occurred between 2000-2008, during which time Yefman documented Gil’s intimate process of transformation from male to a female, and her subsequent transformation back to become, in Gil's words, "beyond any gender". Visit Spaces Corners to preorder a signed copy of Let It Bleed.